By Clément de Fauquembergue, 1429. France National Archives. 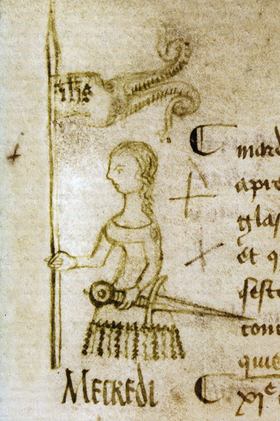 Joan of Arc is considered as a heroine of France for her role during the Lancastrian phase of the Hundred Years' War. Joan convinced the embattled crown prince Charles of Valois to allow her to lead a French army to the besieged city of Orléans, where it achieved a momentous victory over the English and their French allies, the Burgundians. After seeing the prince crowned King Charles VII, Joan was captured by Anglo-Burgundian forces, tried for witchcraft and heresy and burned at the stake in 1431, at the age of 19.